One of the best experiences we had in Mexico was a tour we booked with a catamaran, that took us to a sand bar in the middle of the ocean! It was my first trip to such a sand bar and I was so impressed by it! Marina La Bonita is a company which offers a variety of catamaran trips in the riviera Maya area. They have two catamarans, which are both quite new and in excellent conditions! I love sailing with catamarans, as with them you barely feel any movement. Even if the ocean is a bit rough, the catamaran is very stable and you rarely feel the waves. This is especially good for people who usually feel sick on boats. Another reason why I love catamarans is because they are usually more spacious than boats. Hiring a catamaran was certainly one of the things we had in mind for our Mexico trip, as the ocean in the are where we visited is absolutely incredible. Let’s start with the fact that it is home to the second biggest reef after the one in Australia. Also, it is well-known for not having sharks (the water is too warm for them, luckily), which means that you can enjoy a swim or dive in without fear! The trip that we booked was with Catamaran Adelita and our destination was a sand bar in the middle of the ocean. We sailed for about an hour to get there! 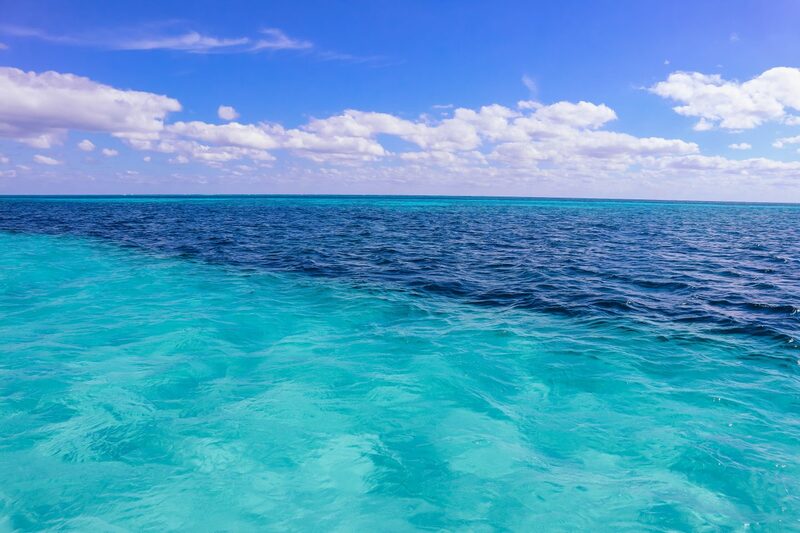 The sailing was extremely relaxing, as you can enjoy getting tanned and watching the beautiful waters of the Mexican Carribean! Once we got to the sand bar it was very easy to spot its perimeter, as the color of the water was much lighter (the reason for this was that the sand was only 1.5 meters below us). That is right! Once the catamaran stopped and we jumped into the water, it was only about 1.5 meters deep. We were in the middle of the ocean and if we were to swim off the sand bar the water would be extremely deep, however, on the sand bar it was just perfect to lay in the water and relax. As I said it was my first time on a sand bar and honestly I was not even aware of the existence of such places, which is also why I was so fascinated to see it! At the time when we did the trip, we were staying in Cancun and it took us about 40 minutes to arrive to Marina La Bonita. However, if you are staying at Playa del Carmen or Riviera Maya, it would be much closer to get there! The trip was absolutely amazing and I can only encourage you to book it if you are visiting this area! The staff on the boat were also incredible and we were provided with service though the whole trip! We had lunch on the catamaran as well as unlimited drinks! The company also provides a private pick up from your hotel, so your travels are completely trouble free and 100% secure! 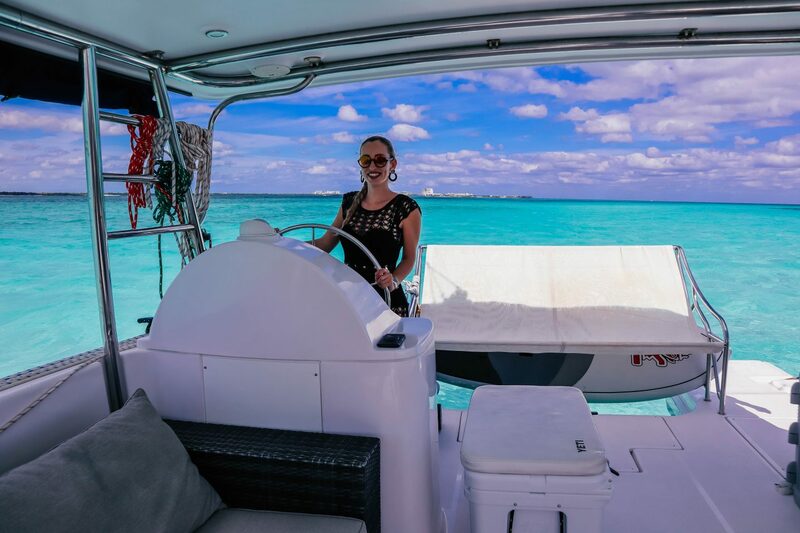 Apart from sailing, they also offer snorkeling, scuba diving, fishing and yachting, so I am sure you will find the activity you desire the most on their list! I love your bikini! Where is it from? ?